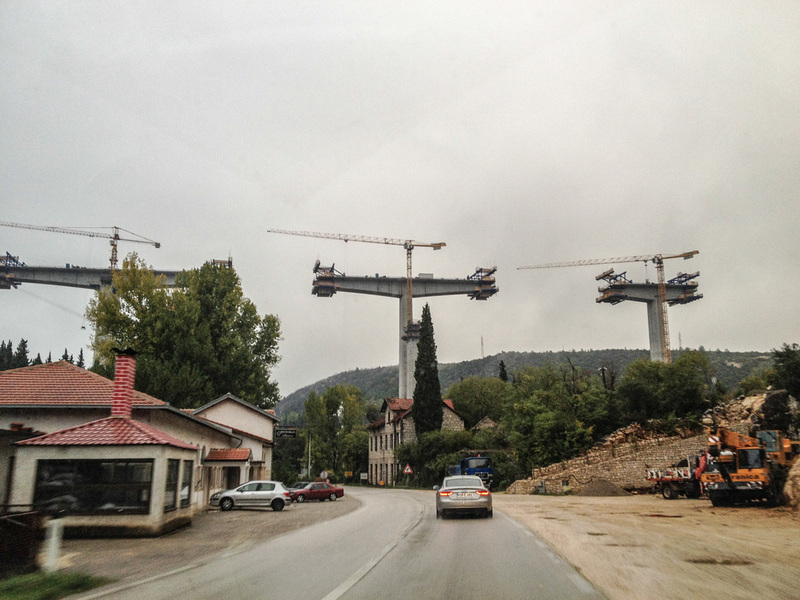 hvar and a balkan road trip — ...and we're off! from split we took the ferry to the island of hvar. it was a friday afternoon, and the sun was shining brightly as we pulled into the harbor. our airbnb host alessandro picked us up and drove us up the hill to our apartment. usually it goes for around $200 a night during the summer, but we got it for a steal at $35 because it was low season. as soon as we walked through the door, we immediately decided to book a second night. the place was huuuge! the main balony spanned both the living room and bedroom and offered a fantastic view of the bay. the shower even had those awesome jets that massage your whole body! we were really looking forward to hanging out in hvar for the weekend. that evening we took one of the many narrow, winding staircases up the hill and made it to the castle just in time to watch the sunset. then we wandered around town, hoping to find a fun bar to check out. normally the town is packed with ridiculously attractive people dancing and drinking the night away at one of the myriad clubs and bars along the harbor, but hvar's split personality was showing its quiet side this friday night. the next day it was too cold and drizzly to go boating, so we rented a scooter instead and decided to explore the island’s less-frequented parts. i'd never ridden one before, so trying it out on a rainy day over mountainous terrain was quite a memorable first experience. we took the old road from hvar to stari grad and enjoyed the incredible sea views as we climbed steadily to some of the highest points on the island. we passed through the old stone village of brusje and marveled at the many criss-crossing stone terraces that dotted the lavender fields on the way to stari grad. after heading up for awhile we eventually had to get down, and that ended up being an exhilarating and slightly terrifying ride. there were a few unprotected drops as we slowly made our way down the steep, sloping sides of the island, and the cold rain whipping our faces didn't help. when we finally reached stari grad, we warmed up with some tea and a nice, cozy lunch. our day of exploring ended with a delicious seafood dinner at a restaurant our friend recommended to us. ever the gracious host, alessandro saw us walking down the street and offered to drive us there. turns out he was friends with the chef, and soon we were taking silly photos and taking shots of a mystery liquor! we took the ferry back to split the next morning and decided to spend the next 36 hours driving down the coast. our rental car turned out to be tiny stick-shift van. our first stop was the port town of omis, which was recommended to us by the front desk girl at our hostel in zagreb. situated at the point where the cetina river meets the adriatic sea, omis’ towering cliffs and gorgeous canyon make it perfect for adventure-seekers. had the weather been warmer, i would’ve tried to make alex go white-water rafting with me. after a quick coffee we continued our drive, admiring the changing coastline. we even passed through bosnia for five minutes, although the next day would be our chance to experience more of it. we arrived in dubrovnik at dusk and checked into our surprisingly spacious bed-and-breakfast run by a sweet old woman. alex had never been before, so we wandered around the old town and marveled at how well-preserved the fortress walls were. it was fun getting lost in the hidden passageways away from the crowded main streets. there are some amazing little apartments there that we’d love to rent someday! monday morning was an early one, since we had a full day ahead of us. our plan was to take the coastal road to montenegro, cross into bosnia via the mountains, then take the highway back to split and return the car in time to catch the overnight ferry to ancona, italy. it was a bit ambitious, but since we were in the car by 8am, time was (seemingly) on our side. after a couple of hours we crossed the border into montenegro – a country i can honestly say i never thought i’d visit, but am very glad i did. it was a drizzly day, which didn’t make for the best road conditions but did give the gulf of kotor an eerily calm ambience. the old city of kotor is one of the best preserved medieval towns in the adriatic, and its beautiful venetian architecture is just one of the reasons why it’s a UNESCO world heritage site. ironically, we ended up in a cuban-inspired café full of young, hipster locals. from there we headed towards bosnia, leaving the pretty coastline for the rugged black mountains from which montenegro gets its name. very quickly we ascended the mountains and were treated to a spectacular view of the gulf. it was a thrill being in a place that suddenly felt very deserted and far from civilization. some of the leaves had started to turn shades of red and yellow, which stood out against the gray skies and otherwise dark forest. we eventually reached the bosnian border, where we were held up for a good twenty minutes. the car in front of us was searched very thoroughly by the police as the two passengers stood around waiting. we tried to make out why, but the license plate didn’t tell us where the men were from. we decided they must either be serbian or have some sort of record, or both. the animosity between the various countries still seemed very palpable. in that moment, we felt lucky to be carrying US passports. once that ordeal was over with, we drove to trebinje and stopped for lunch. the town itself was very quiet and seemed a bit dismal, but the restaurant we ate at was busy, and our waiter was friendly and eager to practice his english on us. after our meal, it was back on the road and time to speed towards split. 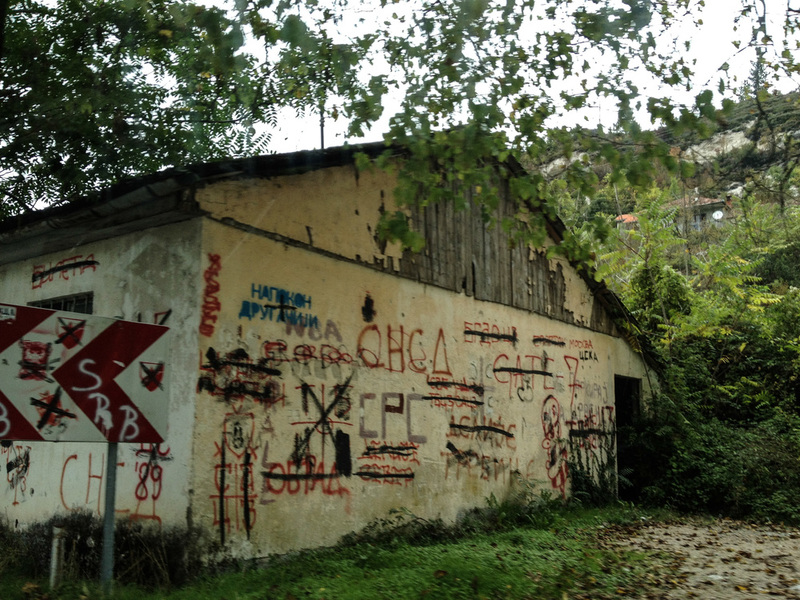 throughout our drive to the croatian border there were several bombed or burned-out buildings and shells of homes and offices that once stood there – a sad reminder of the brutal war in the early nineties. by the time 6:30pm rolled around, we had just crossed back into croatia. it was dark, we were still in the mountains, and the major highway we were relying on was nowhere to be found yet. with our car due back at 8pm, we were getting a bit nervous. thankfully the roads weren't too bad and there weren't any cops, because as soon as we found the freeway, alex gunned it for a good chunk of the way back. our little minivan was doing 90mph on the newly opened highway, darting past what few lost souls were also on the road. miraculously, we made it back to split with just enough time to drop off the car and board our ferry. we were italy-bound!